Kazu Huggler first visited tsunami-struck Rikuzentakata in 2011 after the destruction of the coastal town’s harbour and fishing boats. Its inhabitants had lost not only family and friends, houses and infrastructure, but also their livelihoods. During a subsequent visit to the area in 2013, Kazu met a remarkable cooperative of approximately 14 women, who were living in temporary accommodation. Looking for an escape from the daily reality of their cramped and noisy surroundings, the women had turned to sewing as an activity that they could enjoy together. It also gave them an opportunity to meet and share experiences. Impressed by their determination and strength of character, Kazu helped the women take their sewing one step further by partnering with the Swiss sewing machine company, Bernina International, to donate sewing machines. Kazu then led tutorials on how to operate these sophisticated machines, enabling the women to perform new techniques. Kazu also demonstrated how the women – who, despite being mothers rather than grandmothers, call themselves the Tohoku Grandmas – could create simple and attractive objects using local textiles, as well as unique KAZU prints. In the few short months since then, the Tohoku Grandmas have made a hugely successful name for themselves. Through Kazu Huggler GmbH and the use of Bernina sewing machines, they have taken hundreds of orders for their charming creations. These include delicate textile-filled porcelain sake cups that serve as pincushions, and a range of artistic tote bags. Practical yet beautiful items, they are a poignant symbol of hope following disaster. 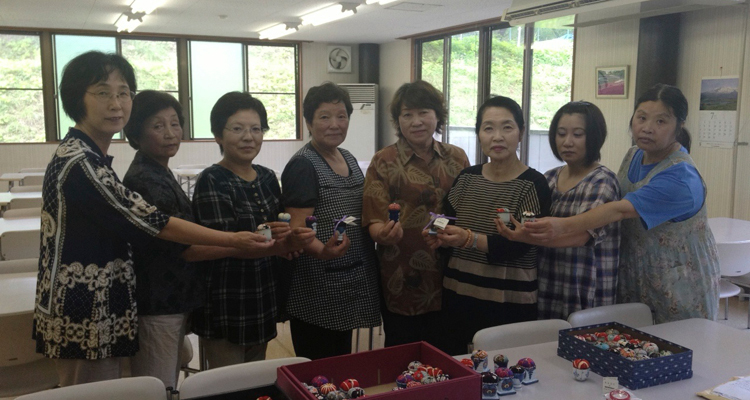 As founder of the Three Cranes Association, Kazu supports the Tohoku Grandmas in the production of their handicrafts by helping to build channels through which the women can sell their work, thus facilitating economic development. Autumn 2013 will see the Tohoku Grandmas visit Zurich as part of a special event organised by Bernina International, Kazu Huggler GmbH and the Three Cranes Association.